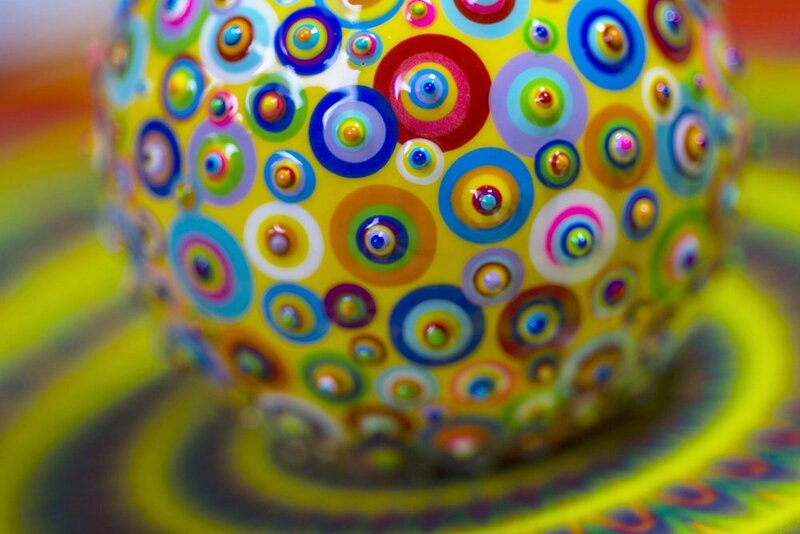 Bindu Terra by Graciela Socorro are 3D and 360 degrees geometric hand-painted art on wooden spheres. Some of these piece are already sold. For Available Works please go to the link. Bindu Terra. 2-1/2". Acrylic and resin on wood. 2015. Bindu Terra. 2". Acrylic and resin on wood. 2015. Bindu Terra. 2", 2-1/2". Acrylic and resin on wood. 2015. Bindu Tesoro by Graciela Socorro are 3D and 360 degrees geometric hand-painted art on wooden eggs. Bindu Tesoro. 2". Acrylic and resin on wood. 2015. Bindu Tesoro. 3", 2". 4". Acrylic and resin on wood. 2016. Follow me for information about events and new work!